The Curvy High Back chair provides additional head, neck and shoulder comfort to bolster the four-piece curvy chair line. 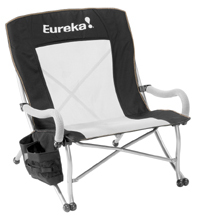 It features padded mesh armrests, a side beverage holder and comes with a carry bag. Curvy High Back Chair: (26” x 45” x 32”); weight capacity: 300 lbs; carry weight: 12lbs Retail: $79.99. For more information, visit www.eurekatents.com.